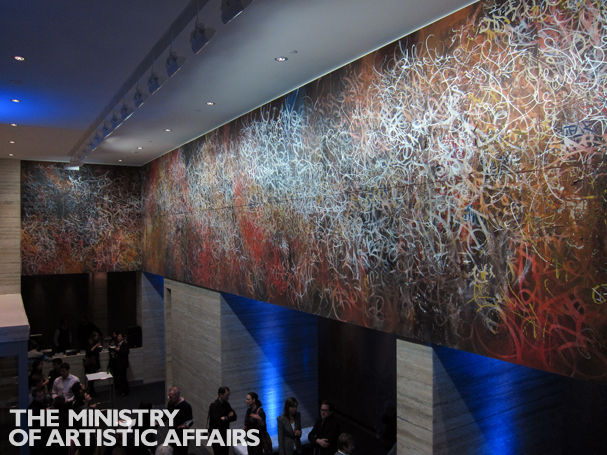 On January 20, 2011, a gala party was held in downtown Toronto for José Parlá to celebrate the reveal of two massive public art murals he painted as a commission for Concord CityPlace. 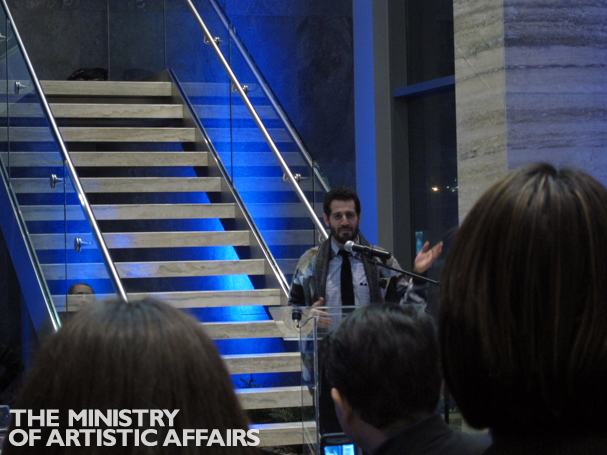 The Ministry of Artistic Affairs caught up with the artist while he was in town and offers the following exclusive interview. 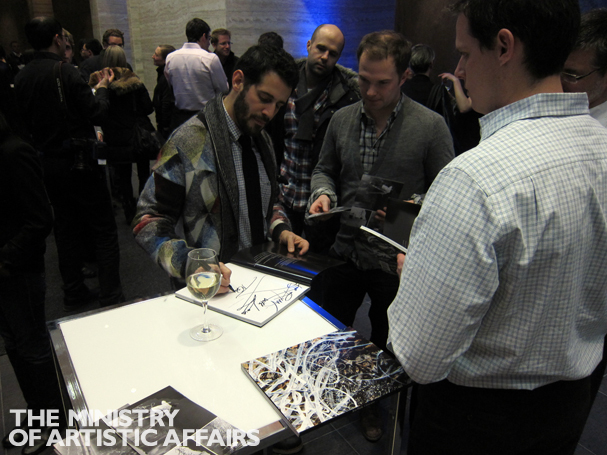 Interwoven into the art and very fabric of his life, travel is something José Parlá does constantly. Born in Miami to Cuban parents, raised in Puerto Rico and now based in Brooklyn, Parlá has spent the last decade journeying with exhibitions of his work around the world. 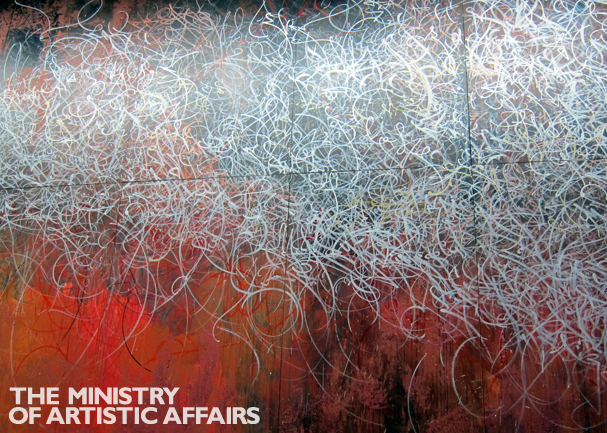 Throughout his years of global wandering, he has developed a highly sophisticated system of calligraphy that reflects, like a mirror, the wear and tear of the urban environments he passes through. Capturing the light in Havana, colors of Istanbul, or the pace of Tokyo, his works are visual meditations on global locations and the people that occupy them. This last point is important because, though abstract, Parlá‘s paintings are all about the characters he meets and the friends he makes along the way. With a Clooney-esque degree of charm spun around a warm, Latino spool, Parlá leaves behind a thread of admirers, companions, and connections whenever he departs for his next destination. 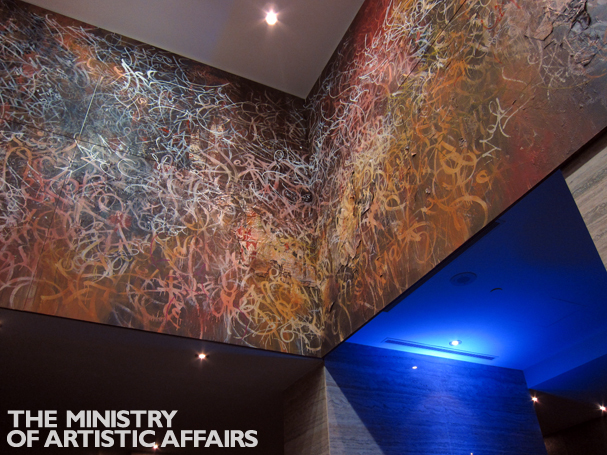 An art school student in the 1980s, Parlá began exhibiting in the 1990s. Since then, his work has been both the impetus and extension of his travels; San Juan, Miami, New York City, Philadelphia, Los Angeles, Houston, Savannah, London, Tokyo, Hong Kong, Amsterdam, Barcelona, Madrid, Bangkok, Sydney, Antwerp, Paris, San Salvador… Adapting and evolving through a transitory, international existence, the kinetic script that forms the basis of his output absorbs various forms of urbanity like a carnivorous sponge. 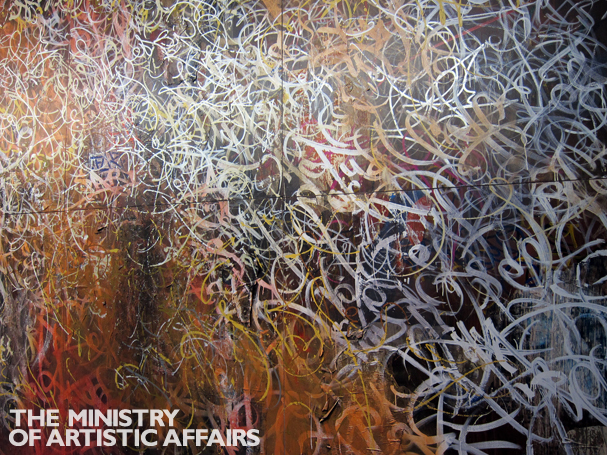 Using as inspiration Asian and Arabic letterforms, Japanese scroll painting and ceramics, and gritty graffiti, his pieces attempt to capture the psychology of reality and authenticity through a maze of memory and an abstracted visual vernacular. The galleries, museums and institutions that have exhibited Parlá’s works are as diverse as they are impressive. Louis Vuitton’s Celux in Tokyo, Nike and Stussy in Los Angeles, Agnes B.’s Gallerie du Jour in Paris, the Royal Mirage/Dubai Cultural Council in the United Arab Emirates, O.H.W.O.W. in Miami, Deitch Projects in New York, and Takashi Murakami’s Kai Kai Ki Ki Gallery in Tokyo are some of the sharpened-edge spaces where his works have appeared. He has had more than 15 solo exhibitions since 2002, his large-scale commissions have appeared in cities like Toronto, and his works have now begun to pop up at important contemporary art auctions, earning hammer prices well into the six digits. Parlá’s artist statement is one of the shortest on record (“Stop Look and Listen.”) but this simple outburst belies his highly aware and thoughtful perspective on important topics revolving around contemporary culture and life. 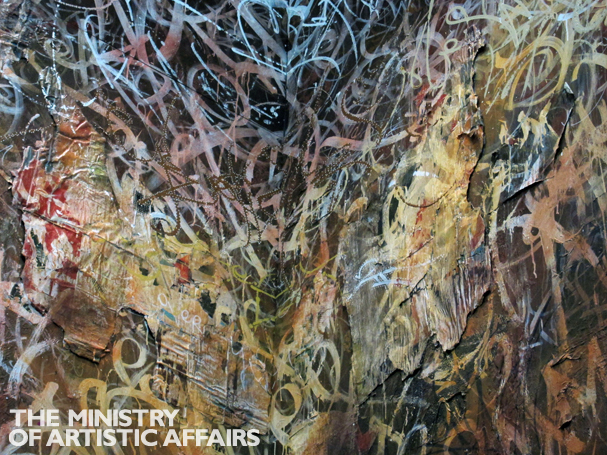 The Ministry’s Randy Gladman conducted the following interview with Parlá to question the artist about calligraphy, calamities, contemporary culture, community, and the Cuban connection. Randy Gladman: You are a thoroughly urban artist. Are you only comfortable in urban environments? Do you ever feel the need to escape to countryside/wilderness? 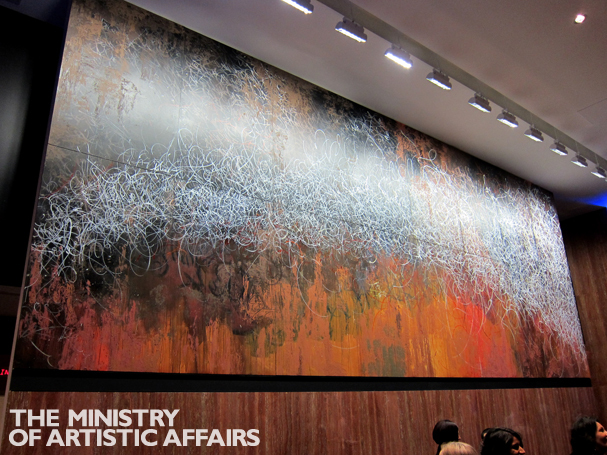 José Parlá: Although urban networks mainly inspire my work, I often travel to spend time in the countryside or the jungle. Last year I was in Colombia where I spent two weeks in the Sierra Nevada jungle in the Caribbean. It is very good for me to do this and return to work with a fresh perspective. I made a painting inspired by this combination of the jungle and city experience title; Hackney Canal, Rio Don Diego; Hackney Canal being in London and Rio Don Diego in the Sierra Nevada. RG: Your work has been referred to as “Cityscapes.” What does this term mean to you? JP: The term “Cityscapes” is a reference to landscape paintings. My friend and curator, Manon Slome coined the term during the planning of a solo exhibition we did together with Al Moran of O.H.W.O.W. in 2006 during Art Basel Miami Beach. Manon had invited me the year before to exhibit with Mimmo Rotella in New York, and by this point we had had many conversations on how my works were inspired by fragments of city walls. RG: You are a product of globalization. Born to Cuban parents, raised in Puerto Rico and Miami, living in NYC, touring the world constantly with the winds of your international career. What are your favorite cities? If you could live in any three cities, which would they be? Can you list specific neighborhoods in these favorite cities you like most? JP: Living in New York feels like I am in many cities with a lot of different cultures at the same time and that is one of the main reasons why I love living here. Aside from New York, my favorite city is Tokyo. RG: Your work has been shown around the world, from Sydney to New York City to Dubai. Are there national differences to the way your work is received? Is Nationalism a good or bad force? Is the world getting smaller or bigger? JP: I don’t know if there are national differences to the way my work is received in different countries. I think that with art, perception is individual. 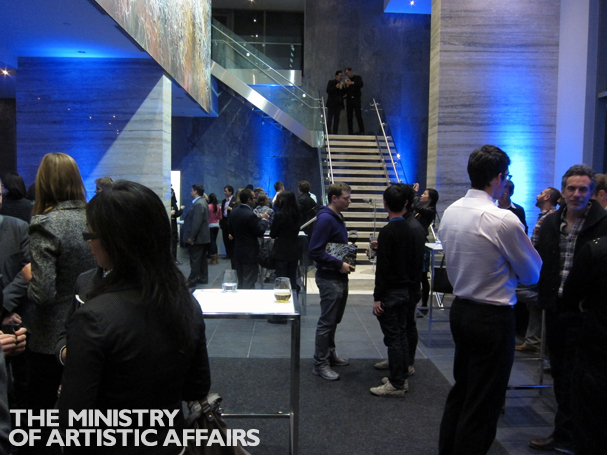 We can imagine that the individual perceives the visual arts through their own cultural scope. As for Nationalism being a good or bad force. This kind of political thought should not be generalized. I would say its both good and bad at times depending on the situation. JP: When I was fifteen years old, my father told me, “Son, you have to find your place in history.” My studio and my life could not make any sense in any other period than what is my own. RG: In much of your work, you adopt the colors and materials of the city in which you happen to be located. Your work captures the textures of surfaces and the moods of the people you interact with along the way. Yet deterioration is often evident in many of the works. Do you see this as a negative movement into the abject or a positive growth of something new and organic evolving out of the surfaces? JP: I find beauty in deterioration and mold, but that doesn’t make me ignorant to the political and financial reasons to why abject poverty exists. In the kind of works that display deterioration, I am painting about forsaken places that I have encountered and met people who are sometimes homeless or very poor. RG: You have called your works “Memory Documents” and “Contemporary Palimpsests.” Please explain what these mean in reference to your work. JP: My works can resemble segments of walls or hieroglyphics, so I came up with the terms to define what I am making. RG: The movement of many artists from the street to the gallery is well documented and a matter of recent history now, including your own. As this transition happened for you, were you active in the process or was it organic? 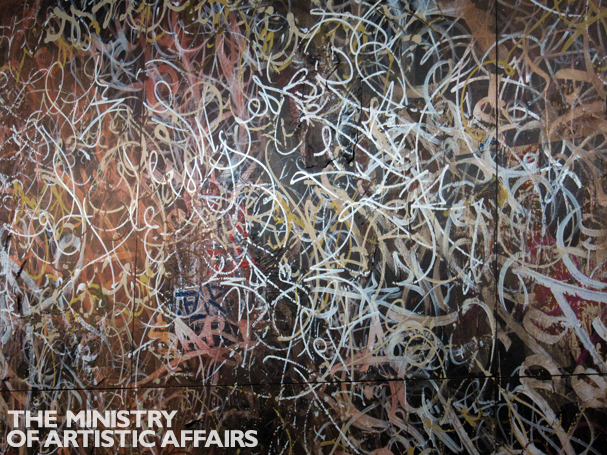 Do you feel there is some kind of conflict or betrayal when artists experience this metamorphosis or is this change the natural evolution of the effective street artist? JP: The process and transition of my work has been organic and at the same time of course I’m active in its process, I’m making the work. Regarding any betrayal or conflict; I can’t speak for anyone artist, but my feeling is that the artist should feel good and have the freedom in their working process to do whatever the artist wants. RG: Tonight we celebrated the arrival in Toronto of two mural-size paintings, for Concord City Place; can you tell us more about this project? JP: Three years ago, Karen Mills, the curator in charge of the project discovered my work through her son Ben. She brought me in and we started talking. I painted the two murals here in Brooklyn, and we just installed them last month. The larger painting of the two is titled, "The Names that Live and Sometimes Fade while Time Flies". I made it as homage to other artists, as it’s layered with hundreds of names of artists I came in contact with over the time I’ve been painting. For the smaller painting titled "The Bridge", I worked from left to right in an arch of writing that resembles a bridge. It’s made up of stories about how New York has become my bridge to the world. This painting is a representation of a bridge from New York to Tokyo, London, and now Toronto. RG: Which global calamity would you choose to fix if you had one all-powerful wish? RG: Is art a good investment? RG: What new projects do you have planned for 2011? JP: My next upcoming exhibition is titled: Walls, Diaries, and Paintings. The opening is on March 3rd at Bryce Wolkowitz Gallery in Chelsea – NYC, and will feature all new works. A new book accompanies the exhibition with the same title published by Hatje Cantz. Standard Culture is hosting a book signing on the 18th floor of the Standard Hotel in New York, which is open to the public on March 5th. This show runs through April 16th. Then in Europe during April, I am doing a solo show in Milan presented by Vladimir Restoin-Roitfeld and Andy Valmorvida, with the support of Giorgio Armani. 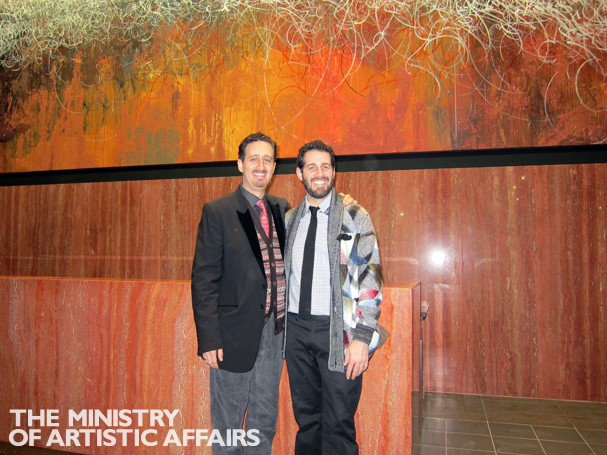 Original content for The Ministry of Artistic Affairs by Randy Gladman.